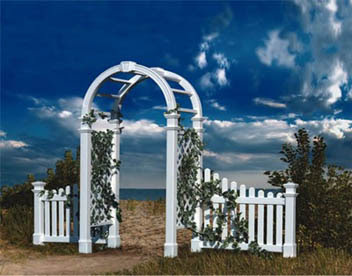 Garden arbors have a way of adding class, design, and flare to any area of your yard or landscaping. Used as decorations for entryways, sidewalks, garden entrances, or wedding accents, garden arbors are multifunctional and attractive. There are many sizes, designs, and materials to choose from so everyone can be satisfied. 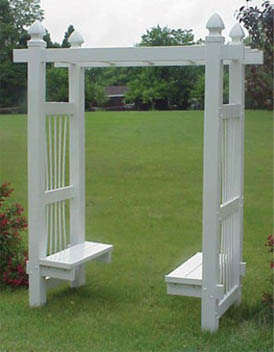 Garden arbors are sturdy, weather resistant, and long lasting like your garden decor should be. No one wants to spend money on decorating year after year, so decorative garden arbors are a great choice. Vinyl garden arbors are long lasting, made with PVC vinyl that won't fade and is very easy to clean. 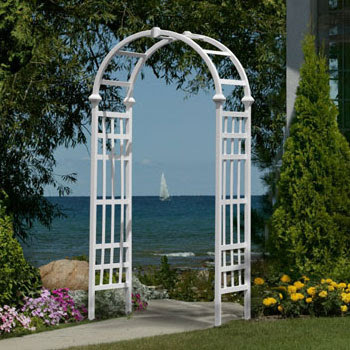 There are different sizes and styles of vinyl garden arbors to suit any space or decor. Small and arched or large and square, some even have benches or planters for adding special touches to the look of your new garden arbor. Wooden garden arbors have a natural appeal to them while providing an elegant and unique touch to your garden space. Adding extensions, gates, or benches to your wooden garden arbor is not only easy but lets you spice up the appeal a bit. 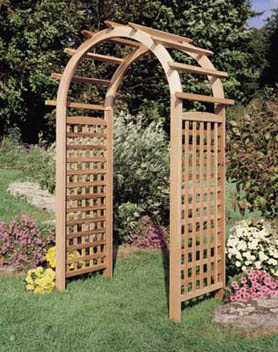 With many sizes, styles, and options, your wooden garden arbor will be a treasured part of your landscaping that shows your personality and style for years to come. Garden arbors can be used in so many places and treasured for many years. Durable and long lasting, the arbor's beauty will not fade with time. Adding ivy, flowers, plants, or other accents brighten up the already amazing appeal of the garden arbor. Many people use garden arbors for wedding day accents then take the arbor home and place in their garden to look at each day remembering their special day. There is no wrong choice when it comes to garden arbors. Take advantage of the easiest way to add spice and elegance to your garden area with beautiful garden arbors.